4in. 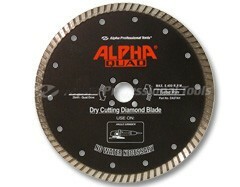 Alpha Plus Quad Diamond Blade - Max. RPM: 14,500. Arbor: 20mm, 5/8in. Exclusively for Flush Cutting Application for Granite Alpha Quad combines the performance of Alpha Plus, the ultimate diamond blade, with our unique design for flush cutting applications. Unlike other blades, Alpha Quad accepts our exclusive Quad Drive Adapter, which eliminates the required lock nut. The Quad Drive Adapter has a threaded arbor that permits mounting on angle grinders for ï¿½ï¿½ï¿½flush cuttingï¿½ÛÃ‚Â applications. The quad driver designed for larger diameters enables angle grinders to be used for cutting applications with their existing safety guard in place. Fabricators use Alpha Quad to make 90 degree inside corners cleanly and efficiently. 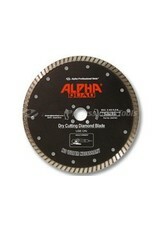 Monument builders can easily clean up marks left from large diameter saw cuts with Alpha Quad. General contractors love to convert their angle grinder into a cutting tool on the job site by using Alpha Quad. This blade is also very popular for sculptors who want to reach tight corners and hard to reach areas. Alpha Quad and the Quad Drive Adapter offer unique features with the performance of the ultimate diamond blade for special applications.